Re: Is That Why You Plant A Garden? Gorgeous! I'm looking forward to the summer and harvest, too. Even without gardening, what a gorgeous place to live! Longer views than where I live. Just out of curiosity, if you don't mind, what town are you close to? Vernal, perhaps? James, you make it look so easy. I get a lot from my garden, but I don't have acres like you do. I do get enough for myself and to share with family and friends. 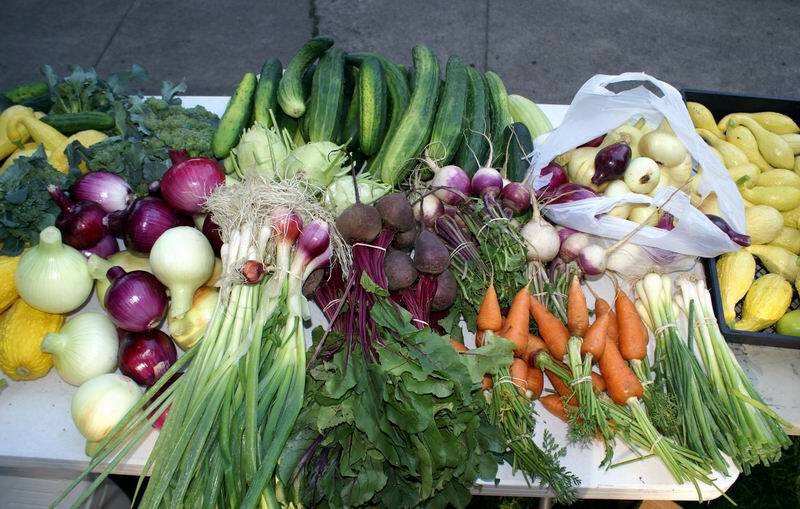 I also get other produce I don't grow in trade. But, I can't even come close to the bounty you get out of yours. Just out of curiosity, if you don't mind, what town are you close to? Vernal, perhaps? I am in Cache County about ten miles South of Logan. Northern Utah. My lot is on the city limits of a small town. Nothing behind except the farmers fields and the mountains. The lot I am on is about two acres. We get irrigation water from a reservoir via a canal and pipeline. So I have pressurized water in the pipes. I sprinkle irrigate. The soil here is black and quite deep. I grew up on a farm. Now an old man...... had a lot of years to try things. Have a great garden! Wow, that is really great. I often wondered how you irrigated such a big garden. I google earthed Logan and see that it lies between 2 mountain ranges; looks like you're in a really fertile valley. Brigham City is one of my favorite towns up that way, even though it lies right next to an interstate. Have you ever been to that little hamburger/ice cream stand called Peach City? That has become a traditional stop whenever I'm up that way! 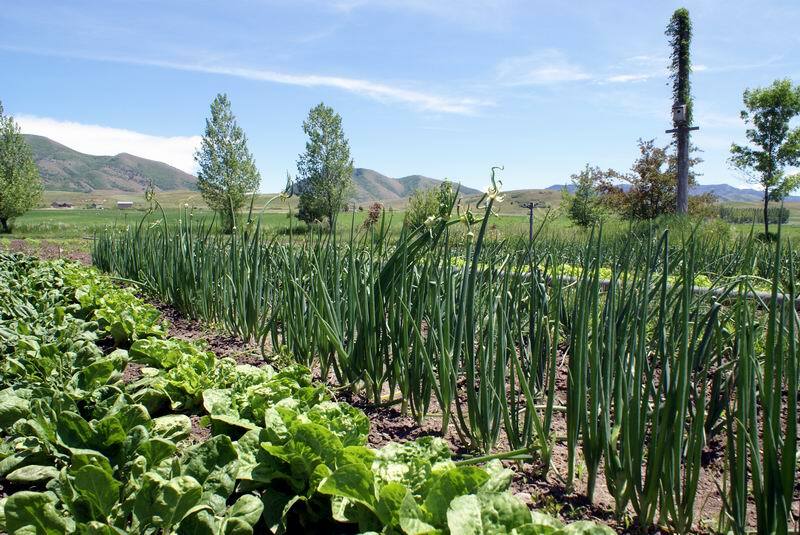 One of my neighbors gave up living in Cache Valley to live and garden on glacial till! Well, I guess he had several years in California before moving north. We could wash a little dirt out of our garden soil, mix in some cement and pave a driveway - increase property values for a quick sale, need resources for that move to Utah ... . I started mine for my 3 year old. She has had so much fun. It's a great feeling to see her wake up every morning to go see her garden. This was 10 days ago.
. quality play-time for parent and child. That's exactly what it is. I think every kid should have a garden. That look of amazement on her face every morning is priceless. Plus they see the work involved and where food actually comes from. Looks like "Garden" can take on a lot of different looks? Where I grew up the garden was just a corner of the grain field where corn, squash, beans and a few other veggies were grown. No beds nor boxes, just a tilled up field. Water came in a ditch and we made furrows with a hoe to run the water between rows. Today, pretty much the same except that my water now comes in a pipe and we sprinkle irrigate. In this dry Utah climate you would not grow much without irrigation, so it is a weekly event to turn on the water. This spring I am making an asparagus bed. Two fairly long rows of asparagus and I plan to put some summer squash between the rows this season. I won't be getting any harvest from the asparagus this season, but should get some next year. It has been raining for three days, I need to get out and finish planting the asparagus as soon as it dries a bit. When I was a kid, the garden was the same. Dad would scrape the corral and moved the manure onto the garden space. One spring, he was a little late flooding that ground. I remember the lush green plants looked a little wilted. When that water hit what was essentially a composting manure pile, the garden practically went up in smoke within about 24 hours. That must have been when I was told that I'd have to take on the irrigation chores in the fields. The Ditch Man reinforced that idea later ... Dad's job in town just didn't allow very much time at home. Mom asked to have the garden moved closer to the house if she was going to be in charge. The next year, she planted her favorite crop, cantaloupe. That's it, only cantaloupe. It was okay with me, I liked cantaloupe . I'd already gotten the message that my life was going to be about doing chores. I was disappointed that it wouldn't be about having a dairy. My "garden extension" again this year will be the outside 35' of a small alfalfa field. That is, it will be alfalfa when the property owner gets the seed in the ground. The "big garden" already sits between 2 alfalfa fields. Irritation is from 4" pipes and the same for both fields and garden. These are the exurbs and none of it my property. People have 3 or 5 or 10 acres and, for the most part, have no special use for the land. One guy nearby sprays his entire front field with herbicide, yearly. About 3 acres, absolutely nothing grows. . . and I absolutely hate to look in that direction when I leave my garden. A house of about 3,000+ square feet, the view from his front windows is bare ground. On the other hand, many neighbors spend almost an entire day each week on their riding lawnmowers. Last edited by digitS' on Mon May 11, 2015 1:13 pm, edited 1 time in total. Taiji, Brigham City is just over the hill from me. About 20 miles West in the Salt Lake Valley, and at a little lower elevation. We always go over to Brigham City for peaches. They don't do well here in Cache Valley, a little too cool. Guess I have not been to the hamburger stand you mention.